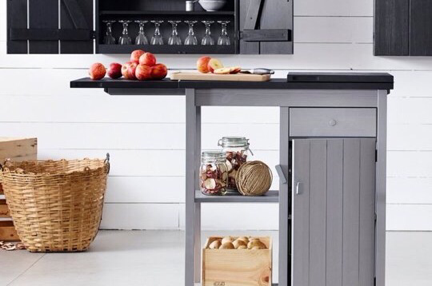 I have a small kitchen but I have been wishing for a kitchen island for the longest time all the while thinking I need a contractor to build one. My husband was watching a cooking documentary on Netflix yesterday afternoon when it suddenly dawned on me that I could get a simple small one from Ikea. I like to do things the moment I think about them if possible and so off I went to Ikea right there and then. I am very happy to have found the Olofstorp Storage Island. It was not listed in the IKEA app. I only found it when I got there, which was good because unlike the other models, this is just the right size for my kitchen. With the expandable top, it is narrow and long - perfect for my smallish kitchen. And it looks rustic too, just my type. I spent three hours assembling it yesterday evening, all on my own, until I needed help to tighten 28 screws that was too tight for my already red and sore hands. I then passed it on to my husband. The island is still standing in the lounge where I was assembling it. He has yet to complete it. I hope to go home today with it in the kitchen. Yea, I've noticed many ikea jokes about assembly of products. The latest one being a priest who bought a crucifix and he need to nail the Jesus figurine onto the cross!